Nautical Ease Inflatable Boat Prep/Cleaner cleans and prepares your inflatable boat for best bonding of protective coatings. Any time a topcoat of any type is applied to an inflatable boat, preparing the surface properly is the critical step! Unless ALL dirt, stains, oxidation, grease, and all foreign materials or prior coatings are completely removed, no topcoating will adhere properly. Nautical Ease Prep/Cleaner will do the job! Nautical Ease Cleaner is safe for all boat surfaces such as Hypalon, PVC/Urethane and Neoprene. Our cleaner dissolves dirt, grease, the white oxidation on red and other color inflatables, even diesel exhaust smudge. Contains no silicones or petroleum distillates, two chemicals that should NEVER be used on inflatable boats, but that are found in most household cleaners. One quart makes 2 gallons. 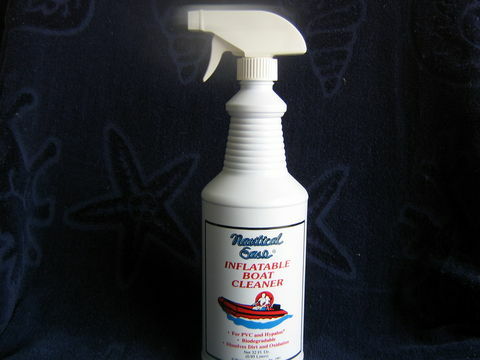 When used for ongoing cleaning and maintenance the cleaner can be further diluted for effectively cleaning not only your inflatable boat but also canvas and other boat surfaces.